Job fair organised by Delhi University students union. New Delhi, A two-day job fair organised by Delhi University students union (DUSU) will begin here Tuesday. The job fair would see the participation of representatives from the Ministry of Information and Broadcasting (MIB) and 45 private companies. DUSU president Arun Hooda told IANS: "Around 45 companies would be visiting the fair along with some government organisations, who will explain to the students the changed format of the Indian Civil Service examination." There would be on-the-spot hiring of graduate students. The fair is open to all students. "There would be face-to-face interactions with the human resource departments of the corporate houses, counselling and personality development sessions and spot shortlisting of students for jobs at the fair," added Hooda. Some of the companies visiting the fair are Wipro, Genpact, Royal Bank of Scotland, Lifestyle, VLCC Institute and Bharti AXA Life Insurance, to name a few. 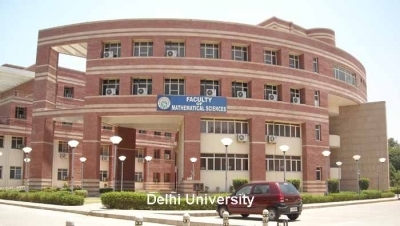 The fair will be held at the sports complex in Delhi University's north campus. > Cracked the highly-competitive IIT-JEE exam. > Delhi University have been made simpler this year following the introduction of the four-year undergraduate programme. > A software developed by an IT firm that provides instant information about students to parents via SMS and e-mail.